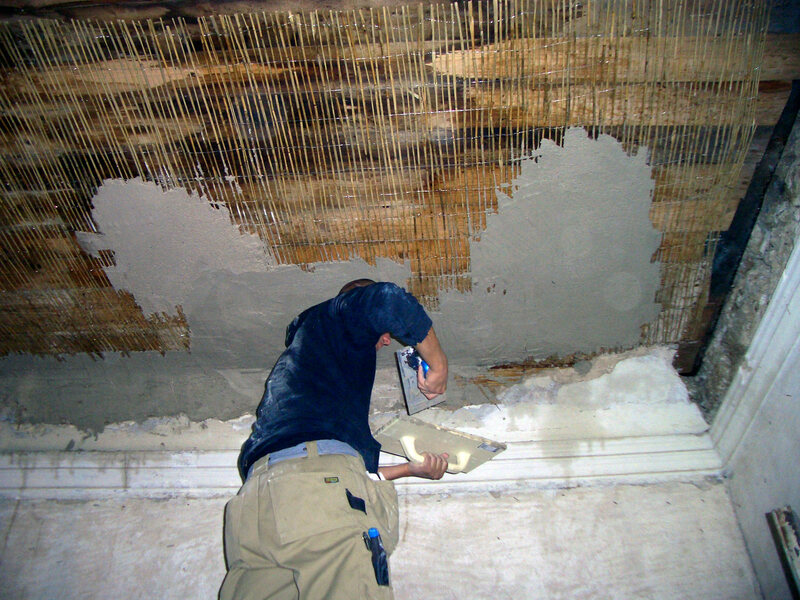 Plaster is made of lime, sand and water. Gypsum or cement can be added for extra formability or strength. Traditionally the plaster is reinforced with e.g. horse hair or straw, and when it is applied to wooden ceilings a mat of sea reed or a net of wooden splints is nailed to the surface to give a good bond. Nets of plastic are often used today where antiquarian aspects are of lesser concern. In churches and stately homes plastered surfaces and details are usually enhanced by decorative painting—either al fresco (on fresh plaster) or al secco (on dry plaster). The motifs vary according to building type and period of architectural style, from Michelangelo to the village decorator. The paint is mixed of lime, water and earth pigments. The colours were more or less the same for centuries until the modern petro–chemical industry started producing endless variations of hues in the middle of the 19th century. In autumn 2013 the intensive course Reconstructing Stucco and Plasterwork (Sustainable Heritage report No. 6) was held at Voltveti manor, Tihemetsa in Southern Estonia. Students worked with decorative plasterwork in many different ways learning about its structure and how to repair it. Many layers of paint were removed from parts of the decorations, surfaces were repaired, missing parts were reconstructed, copies were made and even the technique of running new mouldings was introduced… more documentation, program and images on Hands–On Work in Autumn 2013.